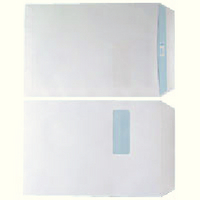 White envelopes for secure posting. Tough 90gsm paper is designed not to rip. Self-seal closure is perfect for high volume mailing. Provided in a pack of 250. Size: C4. Features a window for viewing addresses. Approx Dimensions (CM): D14.5 W24 H37. Approx Weight (KG):3.9.